We’d love your help. Let us know what’s wrong with this preview of And What Do You Mean by Learning? by Seymour B. Sarason. 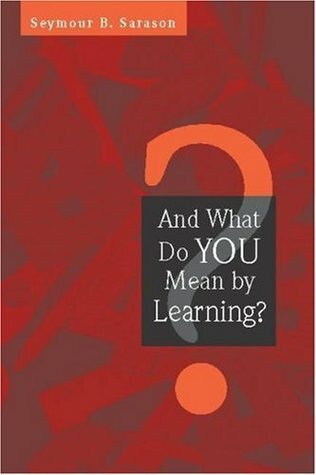 One of America's original thinkers about public education, Seymour Sarason poses the crucial question for all educators-""What do you mean by learning?" "Learning" is the word most used in educational literature and yet educators have great difficulty in defining it. Sarason demonstrates that the lack of clarity about the concept of learning is at the root of the disappoin One of America's original thinkers about public education, Seymour Sarason poses the crucial question for all educators-""What do you mean by learning?" "Learning" is the word most used in educational literature and yet educators have great difficulty in defining it. Sarason demonstrates that the lack of clarity about the concept of learning is at the root of the disappointments of educational reform, the inadequacies of preparatory programs, and proclamations of policy. He takes a good look at another question as well: Why are the principles of learning implied by what parents of preschoolers say and do so different from the principles educators employ? And he goes a step further when he asks: Why is it that no one, educators or otherwise, has ever said that schools are places where teachers learn? Central to Sarason's questions on all fronts is the distinction between the contexts of productive and unproductive learning, the latter being far more frequent than the former. Unlike the words "sticks" and "stones", "learning" is not concrete, visible, palpable. Learning is a process that takes place in a social context involving and intertwining motivation and attitudes, cognitive and emotional responses, no one of which is ever zero in strength. Recognizing this has enormous implications for pedagogy, school administration, and educational policy. Sarason discusses these implications by use of concrete examples familiar to any reader. To ask other readers questions about And What Do You Mean by Learning?, please sign up. Be the first to ask a question about And What Do You Mean by Learning? Sarason is new to me, yet he has been around since the 1940s. Reading his book is like sitting down with a venerable professor during office hours, sharing a cup of tea and hearing the wisdom of all those years. He shares essential resources that have been lost in the glut of educational texts in the last 60 years. What constitutes productive and non-productive learning? Where is "learning" in the climate of standardized testing? How are teachers engaged in learning as they teach? Are they? What contexts are there for learning? How do we create productive contexts for learning? Is the teaching community a place of shared visions and goals or communities of teachers in isolation one from another? What is the relationship of the teacher to the parent? What is the relationship of administration to the teacher? What is the role of creativity in education? What are the negative consequences of imitation?